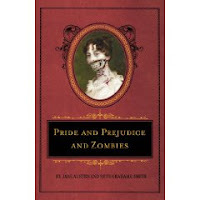 Look, it's the Deluxe Heirloom Edition of Pride and Prejudice and Zombies! Complete with black ribbon built-in bookmark and that cool, scruffy-edged paper... it's a book to be shared for generations to come. Sadly, this fount of literature was not mine to keep. I borrowed it from my stepsister-in-law (I'll leave you to figure out the family tree to that). Apparently the deluxe heirloom edition also has a whopping thirty percent more zombies than the original, and thirteen additional oil paintings. I can't tell you guys if that's better or worse, not having read the first Pride and Prejudice and Zombies, but this one was heavy on the zombie action, and so much fun! For the record, I'm a big fan of Jane Austen. I have her complete works in a lovely, antiquey looking book, also with a ribbon-bookmark and rough-edged paper. It even has old-timey sketches throughout. However, I also have a depraved sense of humor, so I was immediately both horrified and delighted when this new book came out. I wasn't disappointed in either respect, ha! First off, I loved it. I'm also a fan of Saturday Night Live, and maybe this book tapped into my enjoyment of a good parody. The best part about it though, was that I didn't feel like I was laughing AT Pride and Prejudice, it was just a "what if..." What if Regency England had been invaded by zombies (excuse me, I mean... unmentionables)? And yet, after fifty years, things have to settle into some state of normalcy, right? Mothers have to marry off their daughters; rich, snooty jerks have to look down their noses at people who are more charming but less financially fortunate; and of course, people still must fall in love. Against all odds. And even in the face of cursed, wretched beings in a desperate search for brains. I know there's somewhat of a line-drawn-in-the-sand mentality with this book. And I won't argue that it's fine literature, but I will say it's pretty brilliant. And it's funny! Come on, it's hysterical! Darcy's letter, and the little bits about people in the funeral industry being out of work, and balls being interrupted by those locked out of hell, and ultimately... just the whole "ho-hum, zombies, just another day in Meryton," aspect of it-- I smiled and laughed through the whole book. Anyone else read it? Love it? Hate it? What do you think? I haven't read this but I've been really curious. I wanted to like it. I read about half. It mostly just felt like a cheap way to write a book. I love a good parody too, but this one just didn't do it for me. Zombies aren't really my thing though. I didn't really think it was brilliant to basically take a wonderful classic and just add a few excerpts of zombie attacks. Also didn't like how Darcy kept referring to balls in a beavis and butthead way. Very unbecoming of Darcy in opinion. Oh well - glad you liked it Diana. I have to agree with Mary, i began to read it and stopped. I'll more than likely come back to it, but although i realise its parody, it felt like a copy and paste job. I also felt that Mr>bennett satiric self didn't come across that well. Like i said maybe i'll like it more on the second reading? 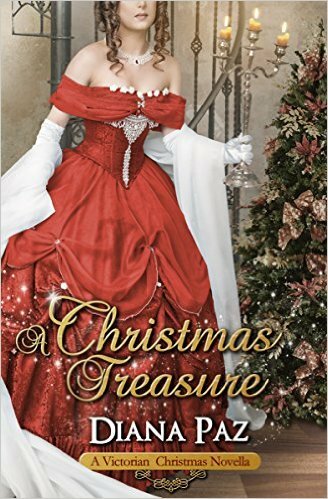 Shannon- Wow, anything that brings readers to Austen is a winner in my book! I've laughed through plenty of sophomoric movies and shows - beavis and butthead included. It just didn't feel right to me to have Darcy do it. BTW I bust a gut at movies like - 40 Year Old Virgin, Knocked up, most Adam Sandler, Ben Stiller and Chris Farley movies. There's plenty more just can't think of them off the top of my head. Hey Diana - I just found the P&P&Z is supposed to made into a movie and Natalie Portman is going to star in it. I might like the movie. I always like that kind of humor better in a movie. Check out this clip on youtube - I laughed the first time and then I played again for my husband and starting laughing hysterically. Go to the blog called Between Fact and Fiction and listen to - A Dramatic Reading of a Break-Up Letter - so funny. Jenna- Oh yes, DO read the original Jane Austen (only) book first. The two are in completely different leagues and, in my opinion, should be read with totally different expectations. I haven't read any reviews from people who loved them both equally. Either they love one and hate the other or vice-versa. The fact that I love the original and enjoyed the zombie version just affirms my belief that there's something very strange about me. Ha! Sounds like fun. Maybe the only way to get my sons to read Austin?!! Well, at first when I read "Pride and Prejudice" ...I thought I knew what you were going to be talking about...one of my favorite movies, nonetheless! hahahaha! And then I read the "and Zombies" Oh my goodness! I haven't read it yet, but I've been looking forward to it. This just sort of seals the deal for me. Geez, my TBR pile is becoming unmanageable. I need to go out and buy this asap!! I heard so many things about this book, and me being a big Austen fan I have to have this. Brenda- Thank you so much for coming to my blog :) Thinking of my brothers, this would be the ONLY way of getting them to read Austen, so you stand a very good chance with your sons. A cross-breed of literature and the relentless pursuit of brains. Ha!! C- Yes Charity, it IS indeed a mockery of classic literature. I don't know enough about Seth Grahame-Smith to make declarations as to his originality and genuineness, but he succeeded in making me laugh and giving me a fun read. I enjoyed it very much, but to be sure, not everyone would. Tina- Ha ha, my tbr pile is ridiculous too! This one is a great read, I think you'll find it funny and entertaining. I did! Nina- Hi Nina, thanks for stopping by my blog :) I'm a huge fan of Austen, but I've noticed most huge fans of Austen hated this book. Be forewarned!! I got this back in September, but it was sent to the TBR pile when I started my WIP. Maybe I can squeeze some time in during the holidays to read it (laughs hysterically at the thought of finding more time). i read the first and loved it but wanted more zombies. 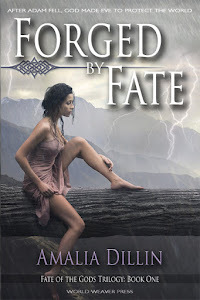 so look forward to adding this one to my tbr pile soon. also looking forward to the graphic novel version next year. and the movie too! I saw this in my local book store and wanted to check it out, but I've never read the original work, so I think it may not carry over so well. Sense and Sensibility and Sea Monsters - hee hee - check out this review on the blog -Dancing with Dragons is Hard to do. I have not read either. Though they are on my very long to "read someday" list. Ugh. Must put it on reading list!